L-R: Skip Kaitlyn Jones, vice-skip Kristin Clarke, second Karlee Burgess, coach Andrew Atherton, lead Lindsey Burgess. Missing, alternate Lauren Lenentine. 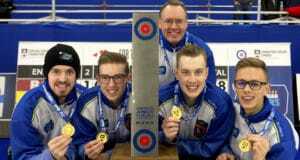 L-R: Skip Tyler Tardi, vice-skip Sterling Middleton, coach Paul Tardi, second Jordan Tardi, lead Zachary Curtis. Missing, alternate Jacques Gauthier. 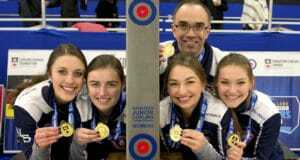 L-R: skip Rachel Homan, vice-skip Emma Miskew, second Joanne Courtney, lead Lisa Weagle, team coach Adam Kingsbury. 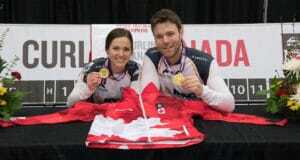 Missing, alternate Cheryl Bernard, national coach Elaine Dagg-Jackson. 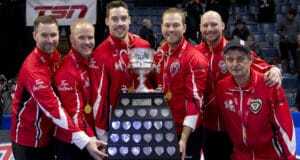 L-R: skip Kevin Koe, vice-skip Marc Kennedy, second Brent Laing, lead Ben Hebert, alternate Scott Pfeifer, team coach John Dunn. Missing, national coach Rick Lang. 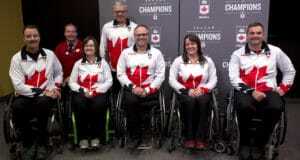 L-R: alternate Jamie Anseeuw, Canadian Paralympic Team Chef de Mission Todd Nicholson, lead Marie Wright, coach Wayne Kiel, second Dennis Thiessen, vice-skip Ina Forrest, skip Mark Ideson. 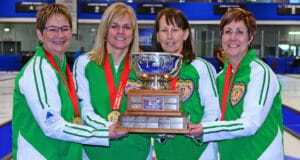 L-R: Skip Sherry Anderson, vice-skip Patty Hersikorn, second Brenda Goertzen, lead Anita Silvernagle. Missing, coach Bill Tschirhart. 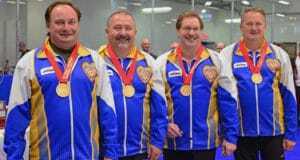 L-R: Skip Wade White, vice-skip Barry Chwedoruk, second Dan Holowaychuk, lead George White. Missing, coach Bill Tschirhart. L-R: lead Megan Carr, second Kory Carr, third Jackie McCormick, skip Trevor Bonot. Missing, coach Jim Waite.